In this explosive debut thriller by theauthor of "Empire of Blue Water, " a brilliant homicide detective returns home, where she confronts a city's dark demons and her own past while pursuing a brutal serial killer on a vengeful rampage. Absalom Abbie Kearney grew up an outsider in her own hometown. Even being the adopted daughter of a revered cop couldn t keep Abbie's troubled past from making her a misfit in the working-class Irish American enclave of South Buffalo. And now, despite a Harvard degree and a police detective's badge, she still struggles to earn the respect and trust of those she's sworn to protect. But all that may change, once the killing starts. When Jimmy Ryan's mangled corpse is found in a local church basement, this sadistic sacrilege sends a bone-deep chill through the winter-whipped city. It also seems to send a message one that Abbie believes only the fiercely secretive citizens of the neighborhood known as the County understand. But in a town ruled by an old-world code of silence and secrecy, her search for answers is stonewalled at every turn, even by fellow cops. Only when Abbie finds a lead at the Gaelic Club, where war stories, gossip, and confidences flow as freely as the drink, do tongues begin to wag with desperate warnings and dire threats. And when the killer's mysterious calling card appears on her own doorstep, the hunt takes a shocking twist into her own family's past. As the grisly murders and grim revelations multiply, Abbie wages a chilling battle of wits with a maniac who sees into her soul, and she swears to expose the County's hidden history one bloody body at a time. 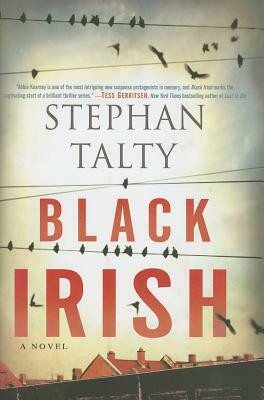 With "Black Irish, " Stephen Talty stakes a place beside Jo Nesbo, John Sandford, and Tana French on the cutting edge of psychological crime thrillers. Luxuriantly cinematic . . . a compulsively readable crime thriller . . . Move over V. I. Warshawski; Buffalo gets its own crime novel heroine. "The Buffalo News"
Talty shows his chops when recounting Buffalo s] Irish roots. "Kirkus Reviews"
Talty does a fine job portraying the cohesiveness of the Irish, their loyalty to one another, and their obsession with their history. . . . A memorable story of betrayal and vengeance. "Publishers Weekly. Stephan Talty is the author of the "New York Times" bestseller "Empire of Blue Water, "as well as "Escape from the Land of Snows, The Illustrious Dead, " and "Mulatto America." "Black Irish" is his first novel.